Developing a name for our company was a challenging endeavor. We wanted a name that we liked, but also something unique. Of course flowers, especially daffodils, tend to drift to the forefront of my mind, so it was an obvious choice to incorporate the name of a flower into our company name. The Tenby Daffodil, 1796, was one of the first 'named' daffodils that we planted in our yard when moving back to Illinois during 2000. This little daffodil has grown wild for centuries on the coast of Wales, and its early blooms were once rushed to London to be sold at Covent Garden. 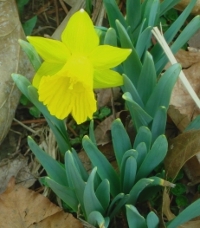 True to form, it is one of the first daffodils to bloom in Shiloh during the early spring. This is a truly wonderful site after a cold winter. Its trumpet is shorter than most species daffodils, adding to its pudgy charm. Because of the timing of its bloom, and perfect shape of each flower, we look forward to seeing it every year. Since our career of choice involves working with new technologies to develop Internet marketing solutions, incorporating 'Tenby' with technologies seemed the obvious solution. Tenby Technologies opened for business during January of 2008. How did you create the name for your business?